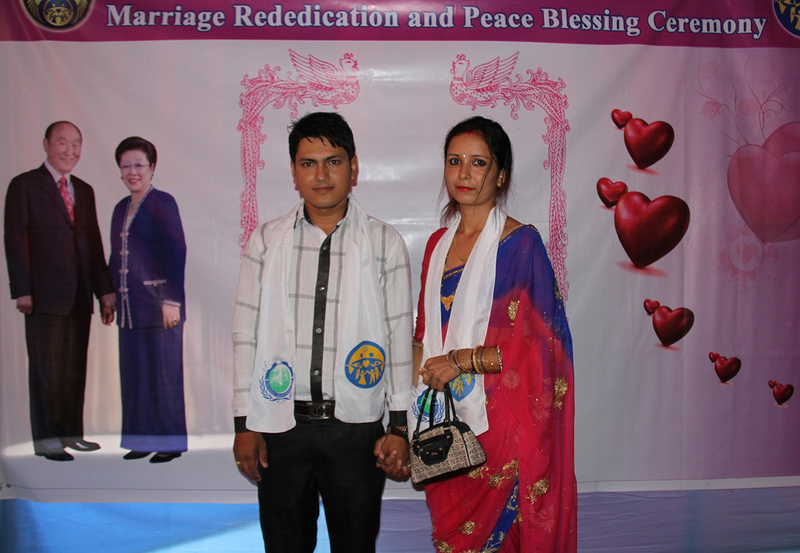 In a rural village in southern Nepal, near the Indian border, 413 people participated in the “Marriage Rededication and Peace Blessing Ceremony” on July 11th. The program was held inside a Buddhist Temple. Among the guests attending the program in the village of Urlabari, 85 came as couples and 205 were married with only one spouse at the program and 36 were unmarried youth. For two days leading up to the event, the local newspapers carried advertisements, interviews and articles about the marriage blessing program. Two religious leaders conducted the Water of Harmony Ceremony: Khempo Rempoche Lama (Buddhism) and Mahamad Saidur Rahama (Muslim). Special Guest, Mr. Jaya Dharma Acharya the Executive Secretary of the Village District Council and an Ambassador for Peace, praised UPF’s principle of one man, one wife. “I didn’t know this was going to be such a good program, otherwise I would have brought my wife,” he lamented. Mr. Acharya went on to say that UPF’s education, which respected the Hindu culture, is very good and its moral education is urgently needed today, especially among the youth. Mr. Bikram Timilsina explained about developments of UPF in the region and plans to build a regional training center with land donated to the Federation. The Officiator was Rev. Santosh Paudel, the President of FFWPU-Nepal. Dr. Robert S. Kittel gave a one-hour presentation about “The Value and Process of the Blessing.” Mr. Binod Dangi, the Deputy National Leader of FFWPU-Nepal, translated for Dr. Kittel and gave the Vote of Thanks. Following the marriage rededication ceremony children from the Holy Child English Boarding School and New Vision International School sang and danced to the delight of the audience. Guests were given a box lunch before departing.